Easily Install Your Full End Assembly In 15 Minutes! Looking for a quick and easy to install end assembly? Our Drive-Tight posts combine the ease of driving an angle post with the versatility of a round post. If you are looking for an easy and quick to install end assembly kit, then our kits are perfect for you. Our drive tight post end assembly kits take less that 15 minutes to install! Our unique Drive-Tight strainer post design and assembly kit can save you hours of work. You could easily do 10 to 30 assemblies in a day compared to the average 2 or 3. All of our Drive-Tight posts are 100NB. You can choose between a 40NB stay (good general purpose stay), or a 50NB stay (more heavy duty). Do you want the ease of driving a star picket and the versatility of a round steel post? Our Drive-Tight steel fence posts allow you to hand drive your post without needing a pneumatic driver. It drives in straighter than a round post, yet still offers the versatility of a round post. You are not restricted by 90 degrees like you are with an angle post. If you have a machine, the Drive-Tight post drives a lost easier and quicker due to the picket base, resulting in less wear and tear on your machine. To ensure that it is secure in the ground, we have included two lugs at a 40 degree angle that allows you to drive two half star pickets at an angle into the ground. These three points of anchorage gives you an extra strong strainer post. Combined with our strainer assemblies, it the entire end assembly can be installed in under 15 minutes. It is the quickest end assemblies available. Don't believe us? Check out the video below. 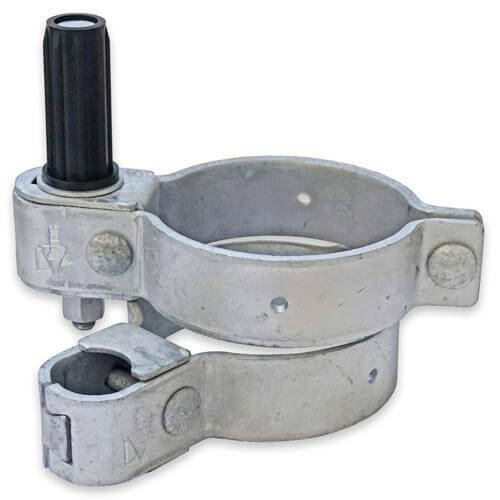 **INCLUDES: Drive Tight Post, Cap, Stay, Post & Stay Connector, Footplate, & Tension Assembly. Need A New Gate Kit For Your DriveTight Assembly? 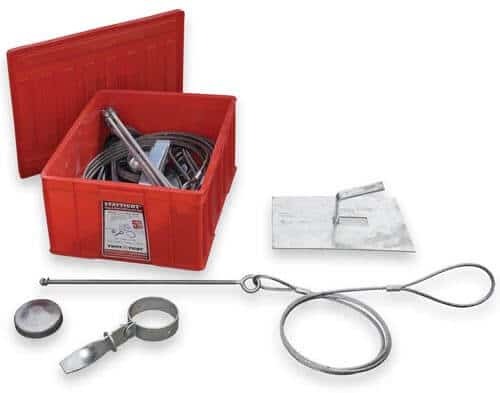 Looking for an easy to install, adjustable bolt on hinge set that won't bruise your livestock? Check out our bolt-on adjustable round post gate kits! Our bolt-on adjustable hinge for round posts, are perfect no matter your post size. A perfect addition to your DriveTight End Assembly. In this video we walk you through the process of installing your drive tight post and end assembly kit. Tip: Where you put your post, dig a dinner plate sized hole about 150mm deep and drive your post in. This will allow you cover the top of the lugs and any star pickets you drive. This gives you a cleaner look and is safer for any livestock.